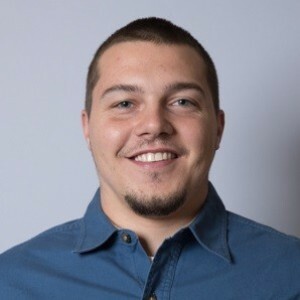 Larry K has a 5-Star rating and leads the company in total reviews, making this pro a ReviewBuzz Rockstar! 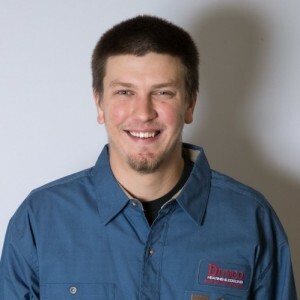 Larryâ€™s 33 years of experience earned him the title of Senior Senior Installer. Time has not diminished his love for helping people or fixing problems. Married for 30 years, with 3 children, 2 grandsons, & 1 granddaughter, his favorite past times involve his faith, family & working on the farm. Great job on a last-minute large project. Very efficient and kept me informed, and the office staff is polite and helpful. No complaints. Arrived on time and completed work in timely manner. Courtesy and professional. Larry and Tyler did a great job! I had my furnace and AC replaced. They showed up on time. I was told that it would take 5 to 6 hours. They were done in 3 and 1/2 hours. They were both very polite. They cleaned up the mess, it was like they hadn't even been here, except for the new furnace and AC. Both Larry and Tyler did an great job putting in my air conditioner and furnace. They were fast but efficient, worked at a steady pace and cleaned everything up when they where done. I was so impressed with how professional Clayton and Tyler were when they came to my house yesterday to install my heat pump and air handler. They went above and beyond to make sure they did a great job! Larry showed up later and also introduced himself and was also very professional. 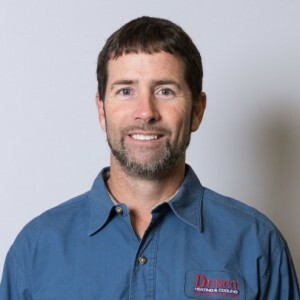 I will use and recommend Dunco to all my friends and family as I was very pleased with their customer service, professionalism and quality of work. Just replaced my AC and furnace. Dunco Heating & Cooling (Lawrence, KS) did the work. Larry and Tyler did the installation. Everything went smoothly and I am very happy. Highly recommend this company. Tyler and Larry worked on my Trane Heat Pump. They were efficient and courteous. 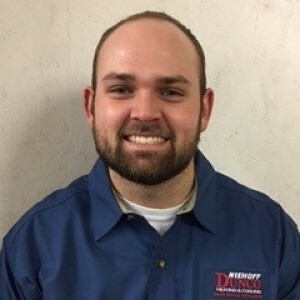 Glad I have my annual service agreement with Dunco, great service! Larry did a very good job for us. He was not the tech that troubleshot our A/C, but he did the repair. When he got to the house, not all of the parts needed were ordered. He just adapted and made the repair anyway. Thanks!!! I hope this coil lasts longer!! 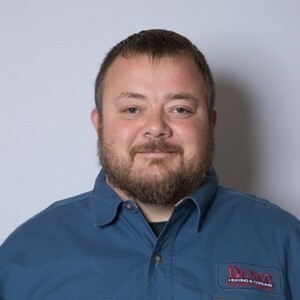 I work strongly recommend Dunco Heating & Cooling! We bought a new furnace and air conditioner two years ago. We have had a maintenance check every season and discovered a factory coil problem. They were very professional with fixing the problem before it became hot. Awesome group to work with. Very professional. Steve, Larry, and Vince all did a wonderful job of taking care of us in a timely manner. We had a new furnace and air conditioner put in on a rainy muddy day! Larry and Clayton had to work in the rain and mud to do it. Not only did they get everything done in a timely manner but not a spot of wet or mud on the floors! They explained the new system to me and answered any questions that I had! 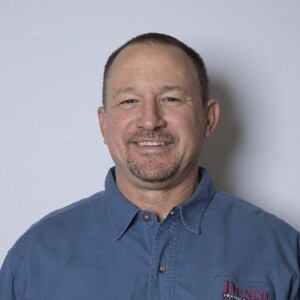 I am so glad we found Dunco Heating and Cooling! I keep forgetting to send a message to thank you for the wonderful basket from the chocolate factoryâ€¦what a great surprise! Everything in it was absolutely delicious and we even shared a little bit! Mark turned the A.C. on a couple days ago and itâ€™s working great. Thanks! Joe did a nice job in developing the estimate. Clayton was polite, professional and efficient. Larry was personable, efficient and informative. Phil was helpful, descriptive and metal. Vince was outside but polite. Installation and clean up were superb. Good people with whom to work. Charge was the estimate. Couldn't ask for more. Duct Work Kings The service we received was excellent from Clayton and Larry. We wanted to change something last minute and they were able to accommodate and re-make the duct work to fit these changes. They were very speedy and the area was left clean of any debris.